Ride hard all day and walk directly across the road to your home away from home. Stylish and comfortable you'll want for nothing. Relax on leather lounges in the sun drenched living area full of light and so cosy. Gas log fire and underfloor heating throughout (winter months only) keeps you toasty warm. Double duo doors open from the living area to the deck with BBQ and awesome views to Eagles Nest & beyond, overlooks the river to beautiful valley views. Cook up a feast in our huge gourmet kitchen, we love to cook in our family so you'll find everything you need here, including a great choice of spices and cooking basics. We have a Nespresso Coffee Pod machine to keep the coffee freaks happy. All level walking to the village..NO HILLS! . *Ground Floor - Bedroom 2 with quality double bed & set of bunks (sleeps 4 ) Bathroom Laundry/ drying room with washing machine and a dryer, Undercover carport right at your backdoor! The River Inn with German beer hall ,restaurant and sun deck (excellent apres ski in the sun) is directly across the road. 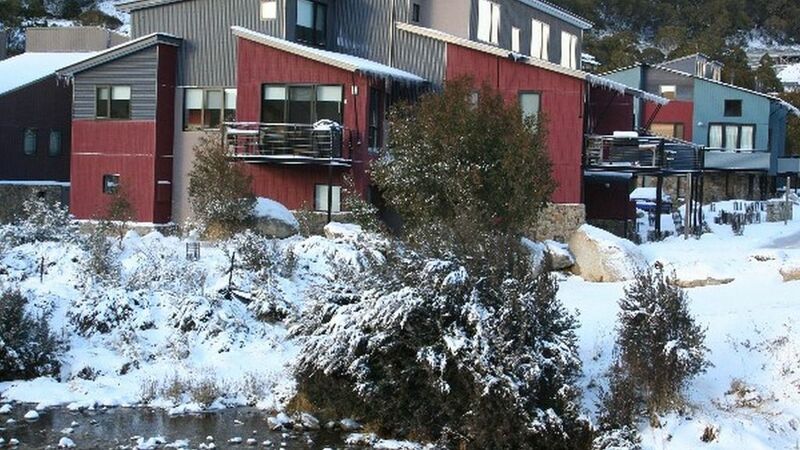 All of our guests say it's the best location & unit in Thredbo..
Don't forget about Thredbo in the warmer months. Such a beautiful place! So good for the soul. Take a dip in the river right outside the door, just to get the senses going! Try your hand at fly fishing, great fun & you might even catch a trout for dinner! ANGALA 4 & ANGALA 1 are available for summer rentals as well. Thank you Paul for you kind remarks. Both Keith and myself are glad you had a great stay. We think Angala 4 is a special apartment. You are welcome to stay again anytime. Beautifully presented & homely property. Excellently equipped with everything you may need. We are glad you had a good stay at Angala 4. Both Keith and myself consider Angala 4 a special apartment in an ideal location. You are most welcome to stay at any time. We had a very good time in Angala 4 in Thredbo. The location could not be better - just walk across the road to the snow fields and lifts. The accommodation is first class, with all the facilities you need and a very friendly and homely atmosphere inside. I would particularly like to thank the owners, Keith and Janine, for all their help in arranging the deal, answering numerous questions, and also for allowing us an extra time for check out. We had a small child with us and those things are very important. I would highly recommend this place to anyone who wants a comfortable and pleasant snow holidays! A big thank you to the owners. We could not fault the cleanliness, the thoughtfulness that had gone into providing everything we could possibly have needed in a holiday apartment, the design, layout and decoration and most particularly, their helpfulness when we struck a problem not of their making. We had the perfect walking break in Thredbo and enjoyed every minute of our stay at Angala 4. I'd highly recommend it to anyone wanting a great location in a terrific apartment - my only concern is that it will be so popular that it won't be available when we want it next time...... because there will DEFINITELY be a next time! Your lovely comments are most appreciated. We are glad you had a great stay in Angala 4. We think it is a very special apartment in a perfect location on Merritts Creek. You are certainly welcome back any time. A five day / four night escape to Angala 4 with 4x 16 year old boys and their mountain bikes. It was brilliant. The apartment had everything we needed right down to bandaids! The upstairs parent escape was perfect for to me to escape to and give the boys some adult-free time downstairs. The living area was well appointed and very functional. The downstairs bedroom / bathroom area gave them their space to rest after big days riding on the mountain and the spa bath was great for easing those sore muscles after all the exercise. The five of us thoroughly enjoyed everything Angala 4 offered, the location, the views, the sound of the creek, the facilities and the fittings. Simply brilliant. We will definitely be back. I cannot recommend this apartment highly enough. Thank you so much for your great comments Greg. We're so happy you all had a lovely time in our apartment & we look forward to welcoming you back again one day. We had a great stay in Thredbo in one of the best equipped holiday houses we've ever stayed in! Proximity to Friday Flat was perfect. Thank you Michael. We're happy you had a great time.